- Dave's expert insights and advice on the essence of powerful, consistent hitting, and on physical fitness and the psychology of winning. - Dave's tutorial on grip, stance, pitches, the swing, and hitting strategy. - Game lets you compete for championship hitter averages, against yourself or up to 3 other players. You select the starting pitcher, league (pitch speed), and major league ballpark. - Practice session delivers different kinds of pitches. You choose pitch speed, batting stance, and swing height. - Computer demonstrates the baseball's actual behavior with various pitches. - Demonstrates techniques for hitting pitches coming in at a variety of locations. - Lets you bat right- or left-handed (or switch). - Plus a handbook to take with you to the field. Batting techniques and body/mind conditioning for winning play. Yankees star hitter and outfielder Dave Winfield is ready to go to bat for you! Dave's three-part approach to hitting teaches you expert batting techniques plus physical and mental conditioning for the game. This comprehensive guide is filled with information and inspiration, offering a hitting lesson with Dave, practice sessions, and competition play. Batter Up! 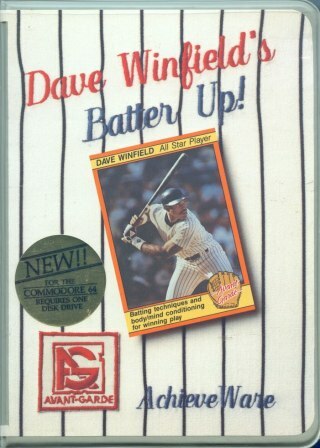 is the product of Dave's twelve years of experience as a professional ballplayer. His program is designed to help you fine-tune your reflexes, learn successful hitting techniques, and be able to use them when you're in the batter's box.